Week 4 of 9. Almost half way there in kilometres as well as weeks on the challenge - I'm jogging half a 5K on my runs this week according to the Couch to 5K app. That's four bursts of running no more than five minutes each time. Still plenty of walking in between. Let's take a quick look at my progress so far before we discuss my interesting time with the TomTom Cardio Runner. If it takes 21 days to form a habit then I feel a small sense of achievement at keeping the challenge going for four weeks so far therefore breaking through that barrier. The habit in this case being getting myself up and out for a jog/walk three times a week. The one session I missed didn't result in me calling the whole thing off. So there's that. Also a half unintended result of this regular, and not unenjoyable exercise, is that I'm eating healthier. Yes. Not out of guilt that my jogging will be for nothing but because of all those endorphins energising me to the point that I'm less likely to slouch around eating pizza. I almost don't believe myself but really it's true. I've even started logging everything in MyFitnessPal - now that I have a chance of getting a healthy balance, I can see my food choices helping to make me feel better about moving more which makes me feel make better food choices. Salads (tasty ones) and soups are helping me keep around the 1,200 calories a day mark but more useful are the daily fat and sugar goals. This won't last forever but it's interesting to be in the middle of it for the first time in a while. And a minor aside, the 15 minute radius around my flat in Elephant and Castle isn't the prettiest part of town. But now I'm out and about in it three times a week (not on my way to work or Tesco or somewhere more exciting) I've started noticing regular dogwalkers, squirrels, how charming some of the estates look painted red and yes, some delinquents on my night runs. After a couple of runs with the Microsoft Band on my wrist (it only conked out once due to low battery which was still annoying) I've got used to keeping an eye on my heart rate and what zone I'm training in. A commenter suggested I might be working harder than I needed to but it turns out I've been in the lower middle of the aerobic zone. As I suspected. The good thing about the Band is that I was glancing down at the main running screen getting all my info in one slurp. 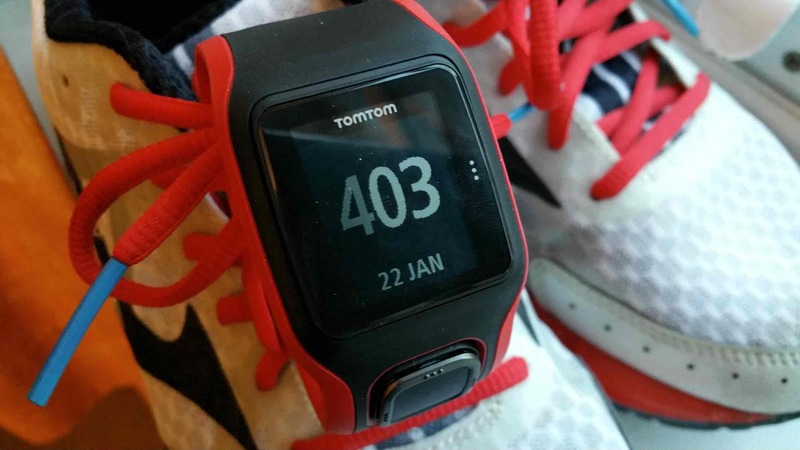 So it was a bit of an adjustment running with the TomTom Cardio Runner this week. It's really comfortable, I love the control pad below the screen and there's tons of vital stats to cycle through. The big, low power screen also makes a lot of sense being so easy to read and the £120 pricetag is perfect as it's very much an entry level running watch. But it's not perfect. You have to sign up for TomTom's MySports online, plug in and set up the watch with it. Then also download and sign into the app before pairing via Bluetooth which frankly, adds up to a faff. The Runner doesn't pair with smartphones running Android 5.0 Lollipop either (causing some unhappy commenters on Google Play). So I had to abandon my Moto X for these purposes and use a Galaxy Note 4 - that's right, my spare is a Note 4. Oh and in case you're wondering, iPhone - as usual - is covered. It also took ages to lock on to my GPS, so much so that it annoyed me - not to mention the fact that I am obviously still running with my phone and the Couch to 5K app. Still, the stats you get out of it are really useful - you can train in intervals, by zones and also try out the Race function to compete against previous personal bests. I'll save that until I've got a few 5Ks under my belt. The heart rate monitor doesn't just tell you what your BPM is, it also tells you what zone you're in too right there on the watch with handy, simple names like 'easy' and 'fat burning'. All pretty beginner friendly. To be honest, the lack of pairing to Lollipop is a dealbreaker for me - if I was a normal person with one smartphone, it would have been game over. Sort it out, TomTom. On my last five minutes of Week 4 Run 2, I was flagging a little and felt I had to bring out the big guns on Spotify namely F*ck Buttons and more specifically the encouraging euphoria of the last track on their album Tarot Sport. Only Flight of the Feathered Serpent would get me through. So again, I scrunched up my (slightly sweaty) nose at the fact I haven't yet used a fitness band or watch that a) I like and b) is useful and c) lets me skip Spotify tracks. Is it too much to ask? I seem incapable of running without the right music so next week, the Sony SmartWatch 3 is up. It doesn't have a wrist-based heart rate monitor but that's alongside my plan for a spot of HRM benchmarking. The highly regarded Wahoo Tickr X heart rate monitoring strap is now sitting atop my pile of fitness gear and I have the Microsoft Band and TomTom to compare. This week I went out with a real running watch and well, I felt like I'd made it, I was in the club. Just think what will happen next week when I go out with a strap, let's hope I don't start sprinting about and ruin all my progress. Farther not harder, farther not harder.